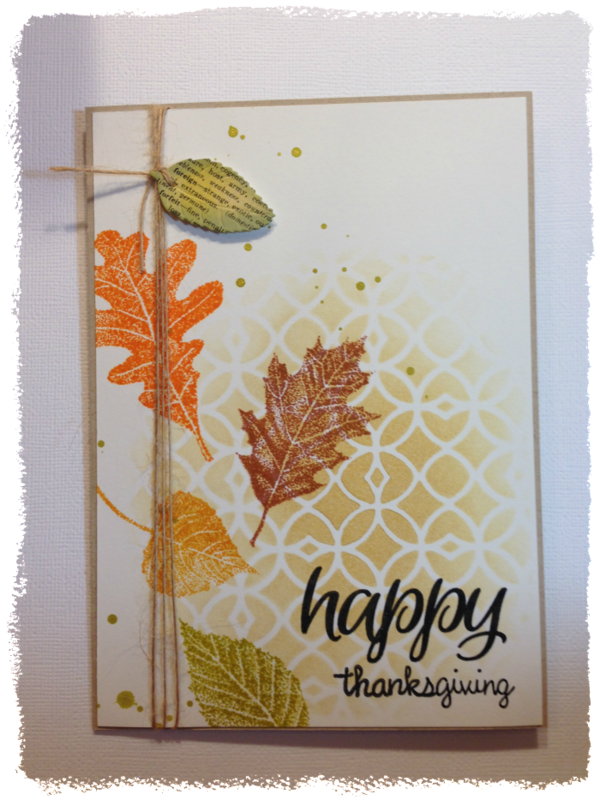 fall leaves card | Vintage Joy Etc. over the weekend i had the pleasure of spending time camping with the lovely scrappy camper sisters, darcie and johnna…while we were away, we took turns teaching each other a little something crafty. of course mine was a card, since they both bemoan making cards, LOL! 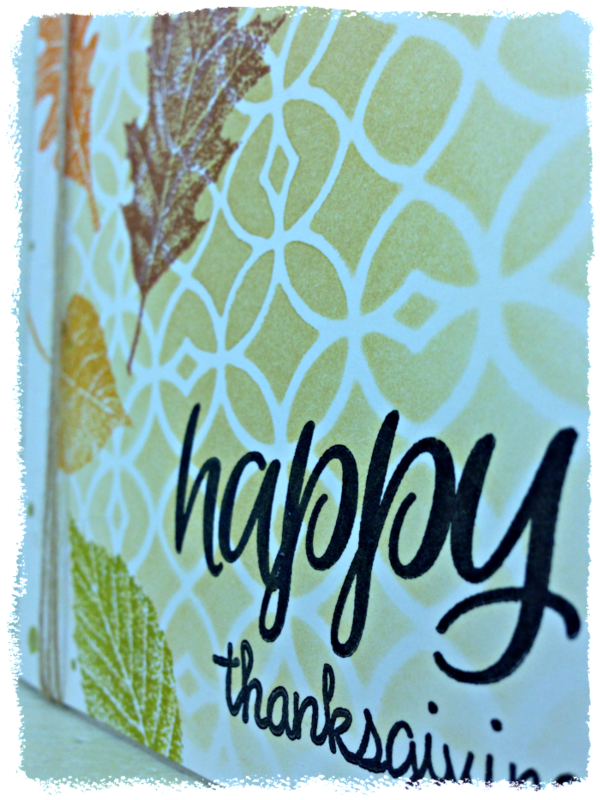 i thought if i gave them a 101 class on stamping etc…they might grow to LOVE it as much as i do….so without further ado…here’s the quick and easy autumn or thanksgiving card i came up with for them. i must confess i was inspired after watching catherine pooler’s recent fall cards on youtube, so i combined several of her techniques into one card! i started off by cutting a 4 3/4″ by 6 3/4 ” panel for the front of my card using strathmore bristol smooth card stock. 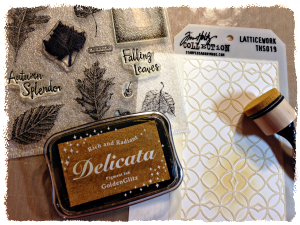 then using the tim holtz lattice work stencil, i sponged on some delicata gold ink in the bottom right card front, keeping the ink very faint as it radiated out. 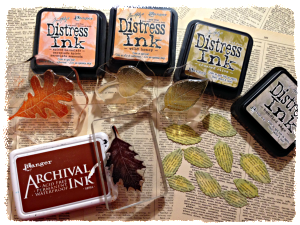 then i stamped on several different “falling” leaves in various autumn colors, using tim holtz distress inks and my favorite ctmh stamp set. 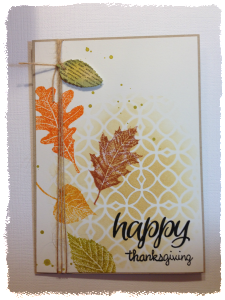 i really wanted to use a die-cut leaf and some of my hoarded vintage dictionary paper on my card, so i backed dictionary paper with plain cardstock and then cut leaves out using a my favorite things leaf die and my big shot. 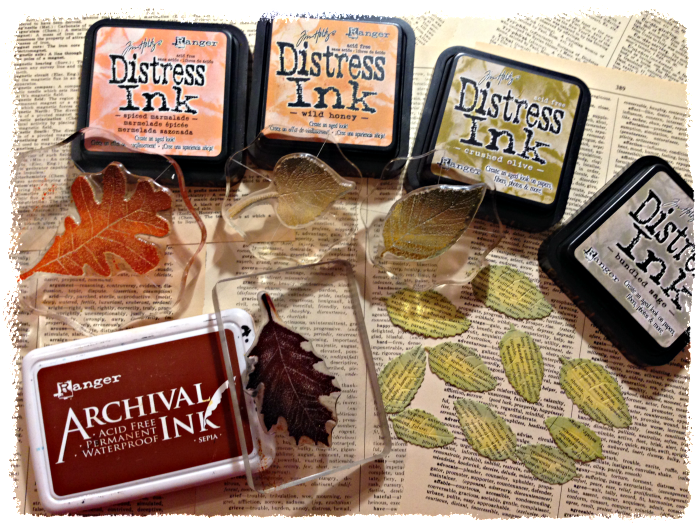 i inked the leaves in several shades of green distress ink. i knew i wanted to add natural twine to my card, so fiddled with that till i got it in a place i liked it. then put a pop dot under the die cut leaf, to help give the card some added dimension. simply finishing the card off with a little splatter (who doesn’t love that?!?) 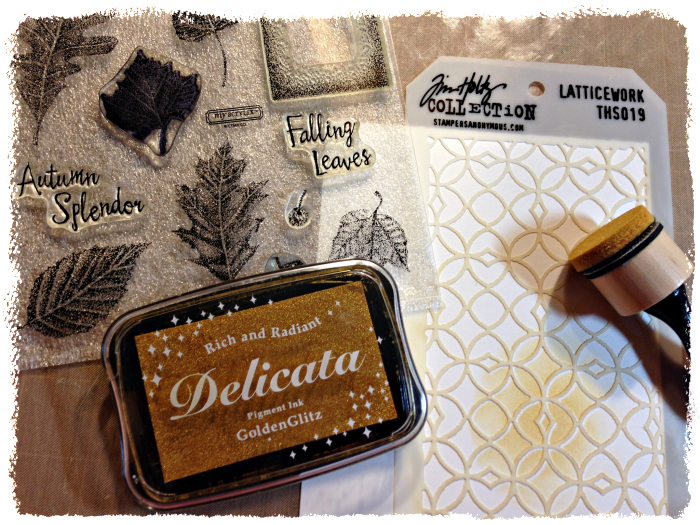 and stamping the sentiment in black memento ink. 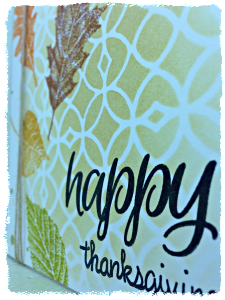 i chose to make mine thanksgiving cards, but they could just as easily be for autumn greetings, or even a masculine fall birthday card. hope you all enjoyed the process and of course, if you have any questions or comments please leave them below…and don’t forget to go check out the scrappycampersisters blog and their ustream channel…they are sooooo talented & just as much FUN! That was soooo fun! I love the card and can’t wait to send one out and of course keep one to pet. It was a great weekend and was so much more fun because you were there! 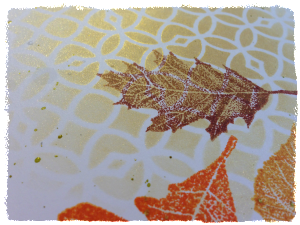 I recently pressed a couple of dozen of the fan-shaped leaves, found note-card supplies at a craft store and had fun with the kids making one-of-a-kind, designed by nature stationery. Your cards are fabulous. You are so very talented. I’m learning a lot from you. Thanks.